Changes in technology and customer behavior — among other things — are changing the world of selling. With information on just about any product readily available on the Internet, the premium for deep product knowledge seems to be taking a dip. Prospects often view competing products and services as the same (even though this is rarely true), and have a tendency to make purchasing decisions based on price. Selling features and benefits in this commoditized marketplace is simply no longer effective. In addition, prospects have developed a ZERO TOLERANCE attitude for pushy or manipulative sales practices (as they should). Salespeople today must now rely on a sales process more than ever in order to demonstrate the value of their products & services and increase sales... a straight-forward, non-manipulative, consultative sales process designed to close every closable deal with zero pressure or discomfort for the prospect. Unfortunately, we can't (and won't) work with just any company. This strict, but reasonable, criteria must be met to be considered. Our training is designed to sell value. This typically means that the teams we train sell at the highest price points in the market (or close to it). This often presents a variety of unique selling challenges that we have a track record of helping sales teams overcome. We help successful businesses go further faster. We know that businesses that have already achieved a certain level of success take action, implement and hold themselves accountable. These are necessary ingredients for improvement, and we can only work with the organizations that we KNOW we can deliver tangible results to. When you know how to SET THE STAGE FOR OPEN & HONEST COMMUNICATION with your prospects, CREATE AN URGENCY TO TAKE ACTION, and SYSTEMATICALLY REMOVE ALL DEAL KILLERS, you will have all the tools necessary to rapidly increase sales and build the business you dream of and deserve. All our material is designed to help you with those three elements, using cutting-edge proprietary strategies and tools. Many sales training systems are built to be delivered at scale. This means that all content has to be watered down, and generic enough to loosely apply to all industries, from auto sales to million dollar software packages and it's effectiveness is greatly diminished. MRG Sales Training is not only customized to specific industries, but it's customized to fit specific companies. The key to mastering anything... athletics, the arts, and even sales... is repetition. Most sales training programs available today are delivered via seminar or through brief training engagements, and because of that, any benefits of that training quickly disappear. MRG Sales Training is designed for lifetime access and continual improvement. A massive flaw in many sales training programs is that they have a tendency to paint prospects as the enemy... as people that make irrational and unpredictable decisions. Nothing could be further than the truth. Salespeople and their prospects are the exact same. MRG Sales Training forces salespeople to examine how they make buying decision, deal with pressure, discomfort, motivation, risk, etc. so they can truly understand how their prospects make buying decisions. We now know exactly how people make decisions... including buying decisions... through countless studies in the fields of neuroscience, behavioral economics, behavioral psychology, biology, neuroeconomics and other social sciences. 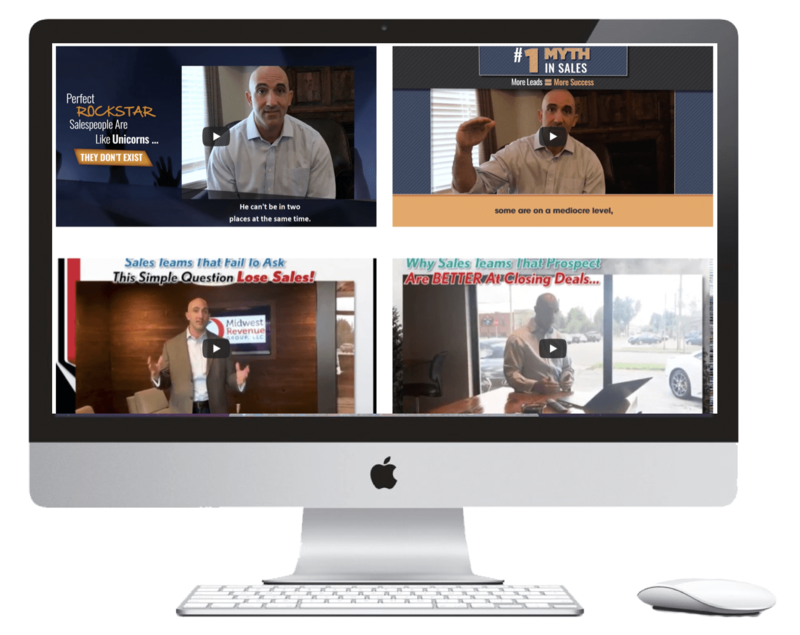 Old school sales myths about pushy and manipulative selling have now been debunked. There is only ONE WAY to sell effectively (like the top 1%), and it's the complete opposite of the selling systems that have now been around for close to 100 years. Custom MRG Sales processes have been successfully adopted by over six-hundred 7-10 figure businesses nationwide. MRG has consulted with, and trained the sales teams of, business icons like Darren Hardy (publisher of Success Magazine and author of The Compound Effect), Dean Graziosi (over 1 Billion dollars in product sales), and Frank Kern (arguably the best direct response marketer in the United States). Should We Be Surprised That Buyers Don’t Trust Us?